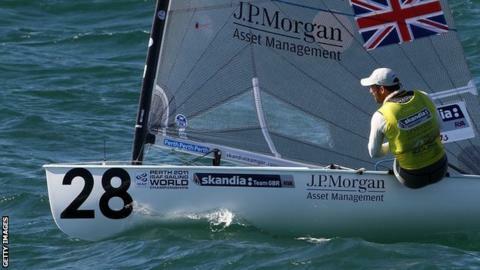 Ben Ainslie is seeking a record-breaking sixth world title at the Finn Gold Cup in Falmouth this week. The triple Olympic gold medallist will be aided by the absence of fellow British world champion Giles Scott, who is on America's Cup duty in Venice. Elsewhere, Britain's 470 women's crew of Hannah Mills and Saskia Clark will be hoping for a second world championship podium in Barcelona. And GB's Alison Young will contest the Laser Radial Worlds in Germany. The 35-year-old Ainslie, who was disqualified from December's world championships after an incident with a camera boat, will face opposition from GB team-mates Ed Wright, the 2010 world champion, Andrew Mills and Mark Andrews in the 94-sailor, 30-nation line-up. "For me it's great to be sailing back in Cornwall where I grew up," said Ainslie, who was named on Thursday as the first UK torchbearer in the Olympic Torch Relay. "I've never really raced here so I am learning a lot. It will be tough and I'll have to raise my game a little bit. "It will be easier without Giles there, though it's still incredibly tough out there to win these races." Olympics-bound Mills and Clark won a silver medal at the Perth Worlds in December, and will line-up at Barcelona's 1992 Olympic sailing venue with 53 other crews. The men's 470 Worlds, being held concurrently, will see no British boats in contention, with Britain's 2012 entrants Luke Patience and Stuart Bithell opting to continue training in Weymouth. The 24-year-old Young was the top-placed British sailor at the Perth Worlds where she finished seventh.